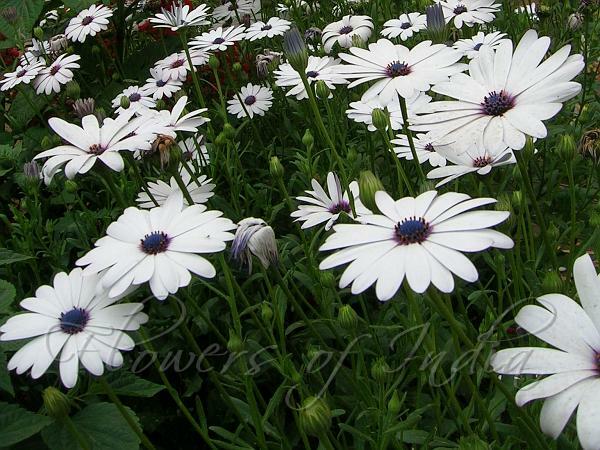 White African daisy is always one of the first spring annuals to flower in Delhi. It is an annual plant, native to Namibia, Namaqualand and the south western Cape. During spring huge fields are covered with this bright white daisy, forming a dazzling mass. The white petals, actually ray florets, are mauve on the underside. For the best display it is important to visit the garden on a sunny day as these sun loving daisies only open with the warmth of the sun from about 10 o’clock in morning to 4 o’clock in the afternoon. As the sun moves across the sky their flowers follow, always facing the sun. African daisy forms a bushy plant that is covered with large white daisies all flowering at the same level. The flowering season is from July to October, depending on the rain. The narrow leaves are light green, about 7 cm long, have indented edges and are alternately arranged on the stem. They are numerous at the base of the stems, becoming fewer and smaller near the top.